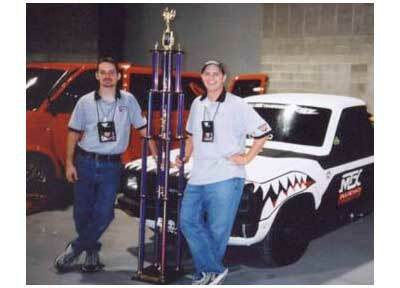 At the 1999 IASCA FINALS the ThunderForce Team members took home 18% of the available trophies. That capped a winning season—150 total trophies for the year. MTX ThunderForce Member Claims New World Record at IASCA, MTX Team ThunderForce Member Upsets Tough Competition During IASCA Finals MTX Audio has announced that one of its MTX ThunderForce Team members stomped out the competition and claimed a new world record during the recent International Auto Sound Competition (IASCA) Finals. Scott Harris stole the spotlight with a first-place trophy in his class — advanced 1-360 watts — during the IDBL portion of the IASCA Finals on Oct. 29 in Oklahoma City, OK. Harris achieved a new world record in IDBL by generating a whopping 166.1 dB, using eight MTX Thunder1000D amplifiers. Harris’ impressive sound machine, an orange 1988 Honda Civic, was also decked out with two MTX LSX2 crossovers and a Coustic CD527 head unit. 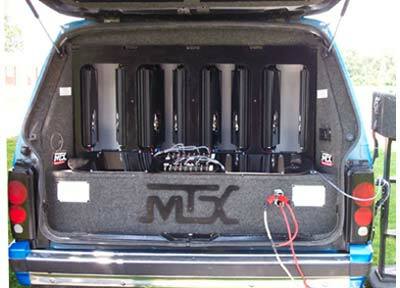 A first time SPL competitor, he said the MTX products made all the difference in his vehicle. "I’ve had so much faith in MTX over the years," Harris says. "The MTX 1000D is the strongest Class ‘D’ amplifier out there, especially in its price-point. The MTX LSX2s are just great crossovers." Thunder81000D Takes Demuth to the Next Level (NASHVILLE, TN) – The first weekend in November marked the 2002 dB Drag Finals held in Nashville, Tennessee. Competitors from around the country came to push sound performance levels to the max. For MTX ThunderForce competitor Jonathan “Tinytunes” Demuth, of Gainesville, Georgia, the weekend closed with the sweet taste of victory. 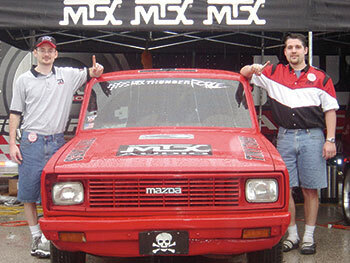 With a final score of 167dB, Demuth and his championship ’84 Mazda B2000 bass machine armed with 16 1500-Watt MTX Thunder81000D amplifiers roared to victory in the Super Street 1-2 NW Class. Demuth attributes his win to his equipment and the people who supported him. 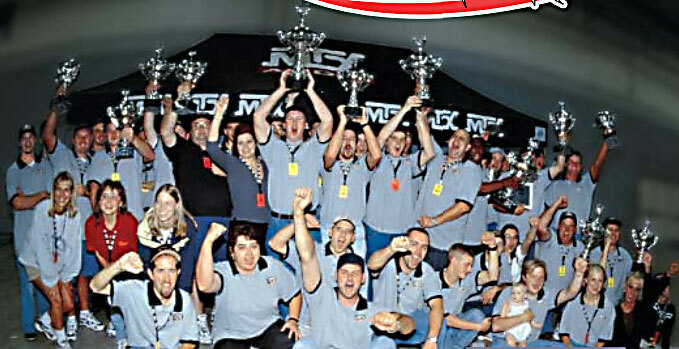 (CHARLOTTE, NC) - In the aftermath of the 2002 IASCA World Finals it became clear that MTX’s Team ThunderForce was on hand with a singular focus: Winning. When the dust settled, four MTX competitors placed in the IDBL competition with two having set new world records. The first record, in the Stock 261-300 class, was set by Chris Warner who won with a final score of 159.5db. Warner, who runs a combination of two MTX RFL152 15” SPL competition subwoofers powered by eight Thunder 81000D amplifiers, edged the competition by a full point and a half. The second record came in the Advanced 1-360 class where Jonathan Demuth, on the strength of his MTX Thunder81000D amplifiers, turned in a winning score of 165db, more than five decibels higher than his nearest competition. Demuth is the third consecutive MTX competitor to claim an IASCA Finals title in Advanced 1-360. Also placing in the IDBL competition were Jimmy Zimmerman finishing third in the Ultimate 1-720 class and Todd Simmons finishing fourth in the Stock 361-720 class. DB Drag is about being the best, and competitors from around the world show up for a contest of "who is the loudest vehicle on the planet." MTX's Team ThunderForce showed its best performance ever at this year's dB Drag Finals the weekend of October 25-26 in Nashville, Tennessee. With two world championships, two 2nd places, three 3rd places, one 4th place, one fifth place and five other placements in the top ten, we are proud to say that the MTX Team ThunderForce has a lot of boasting to do. Kara Lucius extreme 2 competitor is now the loudest woman on the planet with a high score of 169.5dB to tie our current world record holder of the class, Jay Lovelace. Jay also mopped the floor with the competition turning in a score of 171dB to win the Extreme 3-4 class. Gorman Cassidy in Super Stock 3-4 set a new world record in the class of 164.9dB and took two more 2nd places in the event. Scottie Johnson put up the highest score in Super Stock 9+ and also took second place later on in the day. ((NASHVILLE, TN, USA) -- dB Drag is about being the best, and competitors from around the world show up for a contest of "who is the loudest vehicle on the planet." MTX's Team ThunderForce brought down the house at this year's dB Drag Finals the weekend of October 23-24. With two world championships and a best of show, Team ThunderForce members Kara Lucius, John Hellemn, Jay Lovelace and Jimmy Zimmerman finished the dB Drag season even stronger than they began. TForce duo Kara Lucius and John Hellemn, Extreme 2 competitors, are once again the loudest on the planet turning in a high score of 170.5 dB, more than 1dB louder than last year's world championship score at the dB Drag Finals. This award will be added to the stack that the pair has won over the year with eight MTX 1501D amplifiers, StreetWires interconnects and two 15" woofers all housed in the back of their MTX competition van. "We're really relieved to have dB Drag Finals behind us," Hellemn comments. "We had zero failures at the show and we're in pretty good shape now for IASCA and MECA finals coming up in the next few weeks. We're hoping to finish all three finals with championships...that's our goal." Jay Lovelace, now six-time world champion, also brought home a world championship in the Extreme 1 class with a high score of 168.2 dB. After the season he has had, no one expected any less. 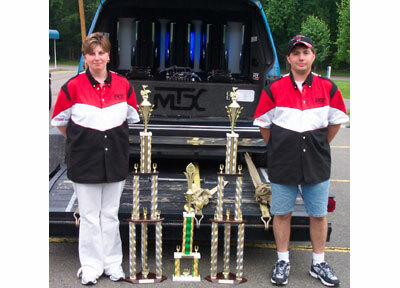 With world records in both SLAP and IDBL competitions along with an extensive collection of trophies from various competitions throughout the year, he showed that his '98 Chevy Astro loaded with twelve MTX 1501D amplifiers and an 18" subwoofer more than adequate to earn him some hardware for his mantel. 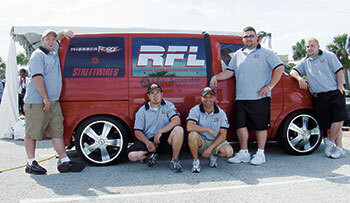 Jimmy Zimmerman and his Team Shady competition van complete with 5 MTX RFLs and 20 Thunder1501D amplifiers took home the award for Best of Show at the finals. The Best of Show title is judged based upon overall appearance of the vehicle including the exterior and interior including the aesthetic appeal of the install. Jimmy Z's brand new van, complete with custom airbrushed exterior, was the ideal candidate for the award. See Team ThunderForce continue their success at the 2004 IASCA finals and MECA finals November 13-14 in Louisville, KY.
MTX ThunderForce duo stole another world record at Extreme Summer Nationals (PHOENIX, AZ) - MTX ThunderForce duo Kara Lucius and John Hellemn have continued their winning streak by claiming another 1st place trophy and new world record at Extreme Summer Nationals in Slippery Rock, PA on July 9-11. The team took their four MTX amplifiers and pumped over 10,000 watts of power into one 18" woofer to secure both titles in their class. Competing in the Extreme 1 class for the first time this season, Lucius and Hellemn were able to out score their competition by almost 39 dB with a score of 169.0 dB. The win was an easy task for the legendary blue competition van loaded with four MTX 81000D amplifiers, MTX Crossovers, StreetWires interconnects and one 18" woofer. The twosome also secured the world record with a score of 168.6 dB turning in a high enough score to have netted the win in the Extreme 3-4 class by three tenths of a dB, an amazing accomplishment for a single woofer system. (CHESTER, WV, USA) - Team ThunderForce duo Kara Lucius and John Hellemn along with teammate Jay Lovelace are at it again. After traveling to West Virginia to attend the Steel Valley Regionals, the competitors returned home with three official world record titles, one potential world record title and a first place in every class they competed. But what else would you expect from three competitors who don't know how to do anything but win? Using eight MTX 81000D amplifiers, two MTX LSX2 crossovers, StreetWires interconnects and two 18" woofers all housed in the back of their blue MTX competition van, Lucius and Hellemn trampled the competition and returned home with all kinds of goodies to add to their already enormous collection. 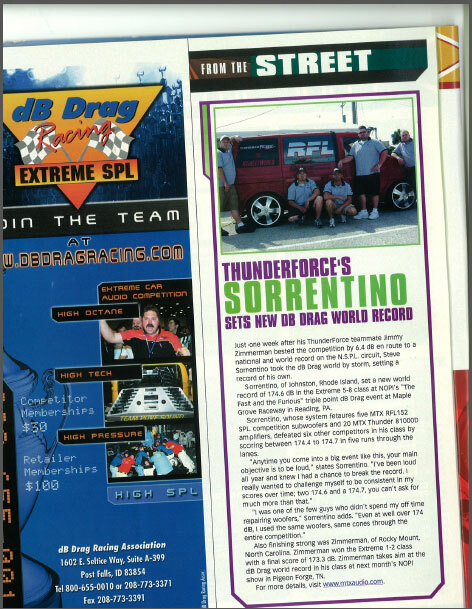 Their victories included a world record and the 1st place in dB Drag Racing Extreme 2 with a high score of 169.9dB, a 1st place and potential world record in MECA X-1 Class with a high score of 165.3 dB, and 1st place and world record in the IDBL Ultimate 261"-- 520" class with a high score of 172.8 dB. Lovelace also proved that he wasn't a guy to be trifled with at the regional competition. Taking home a 1st place in dB Drag (168.1 dB) and world records in both the SLAP (172.1 dB) and IDBL (169.4 dB) competitions, he showed that his '98 Chevy Astro loaded with twelve MTX 1501D amplifiers and an 18" subwoofer was more than up to the task. If there are more world records to be had, Lucius, Hellemn and Lovelace will figure out a way to bring them home. Watch for more wins throughout the 2004 competition season.